Hi everyone! 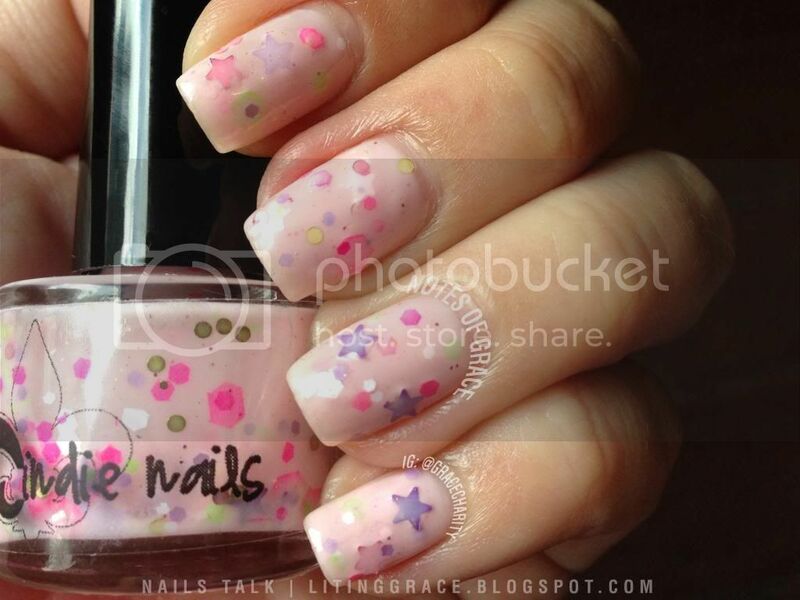 It's time for Nails Talk again! 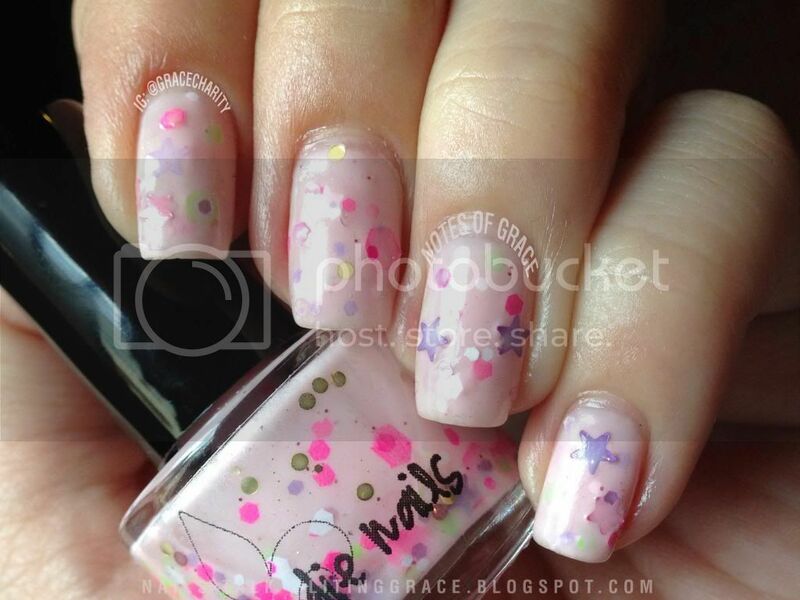 Couple of weeks back, Mei Mei sent me a sample bottle Barbie is Dreaming from Jindie Nails for my review. Jindie Nails is another indie polish brand from the States and are all handmade from scratch by its creator, Jen. All Jindie Nails polishes are made with 3-free, cruelty-free, glitter suspension lacquer base and with the finest ingredients available including non-bleeding, solvent resistent, cosmetic grade glitters and micas. Moving on to the polish. 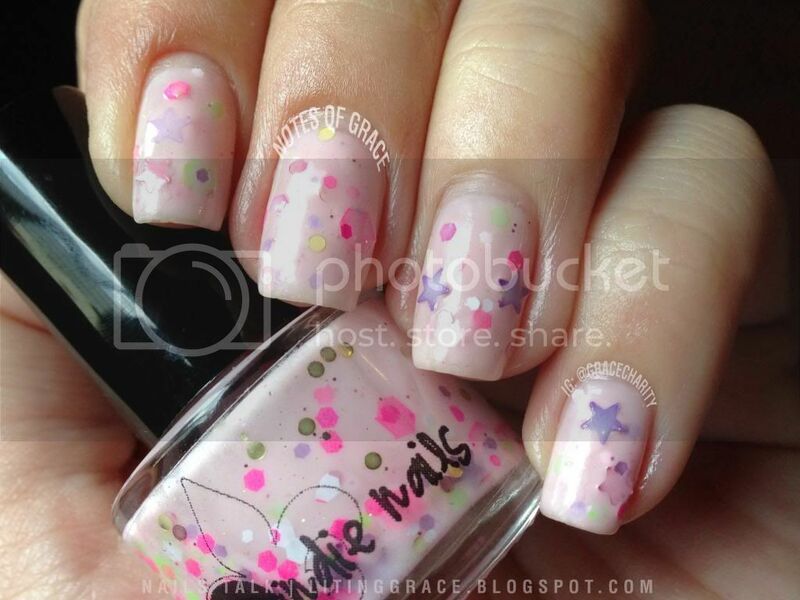 Barbie is Dreaming is an exclusive shade which Jindie Nails created for Mei Mei. Barbie is Dreaming is a pale pink crelly polish filled with neon pink, neon green and white hex glitters; pink and gold round glitters and also, purple and white stars. Of late, I find myself leaning more towards light/pastel colors so I really like the pale pink shade of Barbie is Dreaming. It also accentuate the neon glitters and purple stars. Application was smooth but I had to fish around for the glitters and the bigger glitters but this could also be due to the fact that it was a sample bottle with a tiny brush. I painted three coats and one coat of Seche Vite top coat for the photos. All the photos were taken with direct window light, no flash. Barbie is Dreaming is retailing exclusively at Mei Mei's Signatures at SGD16.00. It's currently out of stock, so do like Mei Mei's Signature's Facebook page for updates on restock. You may also sign up for the email notification via her store. Also, Mei Mei is having several Moving House Sales on her store, so it's a good time for to stock up on those gorgeous polishes!